Foster a collaborative workspace with the help of Zenkit! Where you work can play a significant role in how you work. For business owners and managers looking to enhance employee performance and productivity, taking into account the comfort and practicality of your employees’ everyday surroundings could go a long way. In this article, we’ll take a look at how workspace can influence how office workers work, as well as share tips on how you can make small improvements that can have a lasting effect. Research suggests that physical elements such as office design, indoor temperature, color, noise, and plants can have an impact on the overall performance and well-being of workers. It pertains to the idea that the more comfortable people feel, the more productive they can be—which it’s kind of a no-brainer really. So, how can you ensure that your current office arrangement is the best it can be? Well, it comes down to how your office is laid out as well as what it features. The layout of an office can play a key role in how employees perform and interact with one another. The way an office is designed doesn’t (shouldn’t) happen by accident. Business owners, architects, and those involved in the office plan would have considered the best ways to maximize the space for running a business most efficiently and effectively. Of course, what is deemed an effectively designed office will depend on the industry and the company you are working for. Open-plan offices, for instance, are all the rage for creative and highly collaborative businesses as they allow for ease of movement and don’t conceal colleagues from one another. 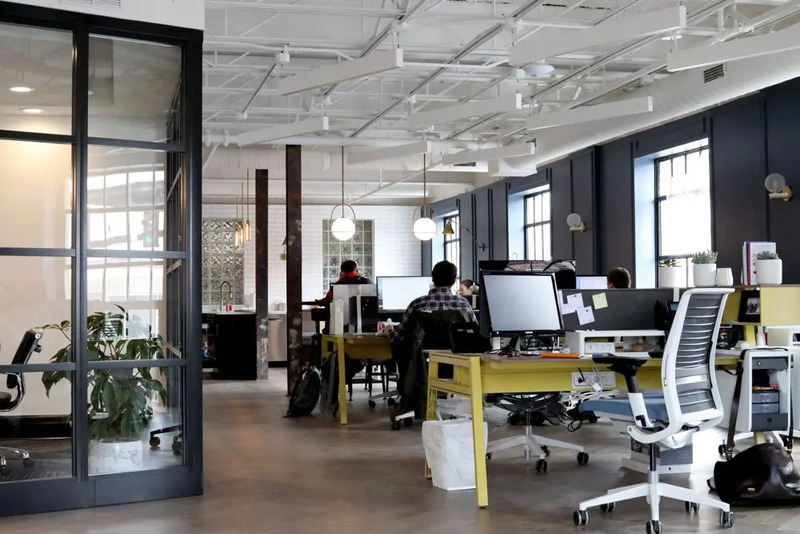 Traditional businesses that require more individual work, however, may find this kind of arrangement noisy and disruptive, and would prefer a space with partitions and private rooms. But office layout isn’t the only determinant of influencing employee productivity. For those who didn’t (or don’t) have a say in the initial office plan, there are still ways you can ensure that your workspace is being optimized to its full potential. The color of the furniture in your office or what color you choose to paint the walls could have an effect on how effectively and efficiently your employees perform. This is based on color psychology, which is the idea that asserts that people’s moods and behaviors are influenced by color. However, it’s not the actual color per se, as color psychologist Angela Wright explains, but rather the intensity of it, “A strong bright color will stimulate, and a color with low saturation will soothe.” So remember to keep that in mind when deciding which color scheme will best suit your office. Plants aren’t just a pretty addition to the office. According to psychologists, adding plants to the office can increase workers’ productivity by 15 per cent. Their presence can have a calming effect and can also have health benefits for the people around them. Another reason to introduce them (if you still needed one, that is) is that because many office workers spend the majority of their lives indoors, having plants in the office will allow them to still enjoy nature and its beauty. Not only do they enhance the look of your office but they also have a deodorizing effect. Windows are an imperative element in any office because not only is working in a dark office unpleasant but it can also have a detrimental effect on your employees’ performances and well-beings. Windows that provide natural light can influence mental alertness, as well as productivity. So, even if your employees don’t seem to mind working in a windowless office, it’s in their best interest (which therefore also yours) to have natural daylight. If a window providing natural light isn’t feasible in your office, then invest in good lighting as it too can be just as influential. Steer clear of fluorescent lights and opt for brighter bulbs. It’s also a good idea to encourage your employees to take regular breaks and go outside throughout the day. Cash-strapped businesses may want to reconsider buying cheaper furniture as a cost saving solution because in the long run, it could have the opposite effect. Office workers are known to spend over 10 hours at their desk each day which means that their furniture needs to be both practical and comfortable. Investing in ergonomic furniture and equipment will not only help your employees to perform better (less sick leave), but will also be better for their overall health (prevent injuries caused from bad posture and computer eye strains). No matter what you do for work, break times are essential for maintaining productivity levels. That’s because your brain is like a muscle, and the more you work without a break, the more tired it gets. It’s a good idea to have an area in your office dedicated to break times. A place where employees can go to relax away from their desks and switch off for a moment. This area should include the appropriate amenities to unwind and eat lunch such as a microwave, refrigerator, and coffee maker. Employee satisfaction greatly impacts their performance, and having a few simple perks like free coffee or a place to heat up their lunch can leave a great impression. When it comes to creating a workspace that works, your best plan of attack is to ensure your office can cater to all types of work. So for ease of collaboration, consider an open space where colleagues can huddle together and work on their ideas, and don’t forget the more private areas for work where individual focus is required. It’s also important to remember that re-decorating and re-designing the office won’t mean a thing unless your employees are happy with it. You can overhaul your entire office and buy the fanciest furniture, but unless your team are satisfied and feel comfortable in the space, then a boost in performance and productivity can’t be guaranteed. Does your workspace work? Share what you love/hate about your work surroundings in the comment section below. We’d love to hear about all the different settings where people work!